Full name NICHOLAS THOMPSON SWISHER…Married, JoAnna Garcia Swisher... Couple has one daughter ...Graduated from Parkersburg (WV) High School in 1999 where he also played football and basketball...Was a heavily recruited safety in football... Appeared as himself in an episode of the television show How I Met Your Mother in February 2010 and Better With You in 2011…Also appeared as himself in the television show The Game in 2007 and 2008...Father, Steve Swisher, hit .216 (305-1,414) in 509 Major League games with Chicago-NL (1974-77), St. Louis (1978-80) and San Diego (1981-82)… Was an NL All-Star catcher in 1976 with the Cubs...Steve was Chicago-AL's first round selection (21st overall) in the 1973 draft out of Ohio University...Managed in the Indians farm system from 1985-88, including Terry Francona at AAA Colorado Springs in 1988...Both Nick (@NickSwisher) and JoAnna (@JoAnnaLGarcia) are on Twitter. 2014-15 Tribe Fest participant. Spent second season in Cleveland, a season cut short due to knee problems that ended his season in early August ... Appeared in just 97 games, his first season not playing in at least 145 contests since 2005 with Oakland ... Underwent arthroscopic surgery on both knees on August 20 in Los Angeles, CA to repair chronic medial knee discomfort in as a result of medial meniscus wear and tear....Procedures were performed by Dr. Neil ElAttrache. Was originally on the 15-day DL (left knee hyp er ex tension) for only the second time in his career from May 27-June 11 and appeared in 2 games on a rehab assignment in AA Akron, June 10-11...Was placed on the DL for the second time in 2014 (3rd career) on August 20th, ending his season. On the year he made 52 starts at first base, 34 starts at designated hitter, 4 starts in right field and 2 starts in left field....His best month was July, hitting .257 (26-101) with 6 2B, 3 HR and 16 RBI (T 11th in July RBI in A.L.) in 26 games, recording his 2014 monthly OPS-high of .692 over the sp an...Was hitting .160 (4-25) in August when he was shutdown for the remainder of the season after playing his final game of the season on August 9th at New York-AL. At the time of his August 10th shutdown he was 10th in the American League in pitches seen per p late ap p earance (4.15) ... Hit his 9th career grand slam and 4th career walk-off home runs on June 19 vs. the LA Angels off Ernesto Frieri, erasing a 3-1 Angels lead to give the Indians a thrilling 5-3 win ... On the year he hit .235 (35-149) with men on base and .234 (30-129) with 15 runs scored and 20 RBI in 34 starts when batting 6th in the lineup . ?ent this first season in Cleveland where he finished amongst the top three on the team in virtually every offensive category and finished 6th in the American League with 77 walks...Ranked among team leaders in home runs (1st, 22), walks (2nd, 77), on-base plus slugging (3rd, .763), slugging percentage (3rd, .423), on-base percentage (3rd, .341), total bases (3rd, 232) and runs (3rd, 74). Opened the season as the club's clean-up hitter and made 72 starts there thru July 21 where hit .249 (66-265) with 16 doubles, 9HR & 27RBI before moving to the 2-spot for the remainder of the season...Also made ten starts in the three-spot in mid-June...In the two-hole he hit .256 (63-246) with 31 runs scored, 11 2B, 13HR & 32RBI in 62 starts...Led the team in RBI in the 2nd half (32)...Spent most of his time at first base (101 starts/112 games) and made 26 starts in right field (27 games)...Also made 17 starts at designated hitter...At first base compiled a fielding pct of .991 (8E, 908TC)...Had some big games, going 4-for-7 with 3 runs, 2 doubles and 2RBI on April 20 at Houston, equaling his single-game career-high for hits and runs while setting a new career-best in doubles...Hit his 8th career grand slam on Sept. 6 vs. New York-NL (Tim Byrdak). Over his last 22 games from September 6-on he hit .294 (25-85) with 4 2B, 7HR & 17RBI (15RS, .968OPS)...Enjoyed his 20th career two-homer game on Sept. 15 at CWS and homered from each side of the plate for the 13th time to equal a MLB record shared with Mark Teixeira....Enjoyed 14 two-walk games on the year...He was 8th in the AL in September OPS (.869, min 100PA)...Suffered thru an 0-for-26 (2 shy of career-long) from June 1-9...Missed 6 games with left shoulder soreness from June 16-22...Indians were 17-4 (.810) when he homered...From August 11-end of season he had 28 RBI in 44 games...Hit .245 (58-237) with runners on base and .164 (9-55) with RISP-2outs...On the season's final day, Swisher went 2-for-5 w/2RBI and homered and doubled in his first two at bats as the Indians clinched the AL Wildcard for the first time in franchise history. Hit .272 (146-for-537) with 75 runs scored, 36 doubles, 24HR, 93RBI and 77 walks in 148 games (107 starts in RF and 27 starts at 1B) with the Yankees in 2012...Among all Major League switch-hitters, ranked third in RBI (first in the AL), tied for fourth in home runs (second in AL) and finished fifth with a .364 on-base pct... Finished 17th overall in the American League in on-base pct (.364), 15th in doubles (36) and 8th in walks (77)...Finished 13th in the AL in RBI and 18th with 227 times on base and 19th in OPS (.837). Posted a .301 (44-146) batting average with 11HR and 74RBI with runners in scoring position and a .303 (20-for-66) average with 5HR and 29RBI with RISP and 2 outs...71 of his 93RBI came while batting left-handed...Hit his fifth career grand slam on April 21 win at Boston, establishing a career-high with 6RBI. Recorded his 1,000th career hit with a 7th inning double on June 23 at the NY Mets...Hit his 200th career home run-a grand slam-in August 13 win vs. Texas...Was also his sixth career grand slam...Hit two solo HRs in August 17 win vs. Boston...Was his 19th career multi-HR game (2nd of 2012) and was his 12th career game while homering from both sides of the plate...Hit game-winning, two-run HR-his 100th home run as a Yankee-in August 24 win at Cleveland. Hit .367 (29-79) from Sept 11 thru the rest of the season...Hit his seventh career grand slam-and third of the season-Sept 20 vs. Toronto...Batted .407 (24-for-59) with 11R, 3 doubles, 4HR, 15RBI and 14 walks in 16 games from 9/19 through the end of the season...Had a higher OPS (.841 to .834) on the road and more home runs (13 to 11) away from Yankee Stadium in 2012... Was tied for 5th among AL batters with 4.26 pitches per plate appearance last season. The Indians as a team ranked 5th among 15 teams in the AL last season with 3.88 pitches per plate appearance. Hit .260 (137-for-526) with 81R, 30 doubles, 23HR, 85RBIand 95BB in 150 games (140 starts at RF, five at DH andthree at 1B) with the Yankees...tied for fifth amongMajor League switch-hitters in home runs and rankedseventh in RBI...Batted .327 (52-for-159, 6HR) vs. left-handed pitching,compared to a .232 (85-for-367, 17HR) mark vs.righties...entered the season with a .260 (233-for-897)career batting average vs. LHP...Batted in each spot in the starting lineup from Nos.1-8...14 of his 23HR came from the sixth spot in the batting order...Recorded 18HR and 58RBIin 90 games from 6/14 through the end of the season...hitjust 5HR with 27RBI over his first 60 games (through 6/13)...Had nine outfield assists, one shy of his career high set in 2010 (10)...Made his seventh career Opening Day roster, third as a Yankee...was the only playerto appear in every inning of the Yankees' first 26 games of the season (3/31-5/2)...Collected his 500th career RBIin 4/8 loss at Boston, driving in Alex Rodriguez witha third-inning RBI-groundout...Hit 10th-inning "walk-off " sacrifice fly in 4/14 win vs. Baltimore and was 0-for-3 with1R, 1RBI and 1BB...was his sixth career "walk-off " RBI, fourth as a Yankee and secondvs. Baltimore...Hit his first home run of the season in 4/28 win vs. Chicago-AL...snapped a 75AB homerless stretch to begin theseason -- his longest home run drought to start a season in his career...according to the Elias Sports Bureau, thestretch marked the third-longest single-season drought of his career behind only a 119AB spell w/ Oakland in2005 and an 81AB stretch with the Yankees in 2010...was 3-for-4 with a career-high-tying 3R, 4RBI and 1BB in thegame overall, snapping a career-high-tying 0-for-19 stretch with a fifth-inning single (also 19AB w/ Chicago-ALin 2008) -- credit: Elias...Hit .326 (28-for-86) with 15R, 7 doubles, 7HR, 23RBIand a .651SLG in 26 games in June...entered the monthbatting .213 (36-for-169) with just 3HR, 20RBI, 31BB, a .335OBP and a .314SLG over his first 49 games of the season...Hit in the leadoff position for the first time as aYankee -- and the first time since 5/4/08 at Toronto (w/ Chicago-AL) -- in 6/15 win vs. Texas, going 1-for-3 with1R, 1 double and 2BB...Batted .409 (9-for-22) with 2 doubles, 2HR, 17RBI, 7BBand 3SF in 32 plate appearances with RISP from 6/16-7/6...Had two RF assists in 6/28 win vs. Milwaukee, markinghis second multi-assist game from RF as a Yankee (also6/23/10 at Arizona)...over the last 40 years, the onlyother players with at least two multi-assist games inRF as a Yankee are Jesse Barfield (two) and Paul O'Neill(two) -- credit: Elias...Played in his 1,000th career game and was 2-for-3 with1R and 1BB in 7/20 win at Tampa Bay...Tied his career high in RBI(fifth time) in 7/22 win vs.Oakland, hitting a three-run HR and going 3-for-4 with2R, 5RBI and 1BB...Homered six times in a seven-game stretch for the firsttime in his Major League career from 8/23-29...Recorded his 17th career multi-HR game in 8/24 loss vs.Oakland, hitting two solo HR and going 2-for-3 with 1BBand 1HBP...was his first multi-homer game since 8/2/10vs. Toronto...Missed three games from 9/9-11 with left elbowtendinitis...Hit .211 (4-for-19) with 1HR and 1RBI in five games duringthe Yankees' ALDS loss vs. Detroit. Hit .288 (163-for-566) with 91R, 33 doubles, 3 triples,29HR and 89RBI in 150 games (131 starts in RF, 11 atDH) with the Yankees, setting career highs in battingaverage, at-bats, hits and triples...made his sixth careerOpening Day roster, second as a Yankee...hit .286(110-for-384) with 25HR as a lefthanded batter and .291(53-for-182) with 4HR from the right side...17 of his 29homers tied the game or gave the Yankees the lead...Among Major League switch-hitters, ranked second inruns scored (91), home runs (29) and RBI (89), trailingonly teammate Mark Teixeira in each of the three categories (113R, 33HR and108RBI)...ranked third in batting average (.288)...Hit .345 (88-for-255) with 15 doubles, 3 triples, 13HR, 73RBI and 29BB with runnerson base, marking the fourth-best average in the AL...Batted in seven different spots in the starting lineup (two through eight), homeringin five of those spots (two, four, five, six and eight)...Had at least three hits in a game 14 times, the most such games in any season inhis career (previous was 10 in 2007)...only Robinson Cano (19) had more three-hitgames among Yankees in 2010...Collected 10 out eld assists, eight more than his total from 2009 (two) and surpassinghis previous career high (six in 2005 w/ Oakland)...Won the 2010 All-Star Final Vote, earning the final spot on the AL's All-Star roster...pinch hit for Ty Wiggintonin the seventh (0-for-1)...with his dad, Steve, a 1976 NL All-Star for the Chicago Cubs, the Swishers becamethe 12th family to have both a father and son named to an MLB All-Star team...Hit safely in each of his first six games of the season with an offcial at-bat for the second time in his career(first nine games in 2009)...Batted .374 (34-for-91) with 7HR and 17RBI in May, markinghis most hits in any calendar month of his career (previousbest was 32H in May 2007 and May 2006)...hit three homeruns in a four-game stretch from 5/5-9 and ve HR in aneight-game span from 5/1-9...Missed four games with a sore left biceps (5/13 and 5/17-19)...underwent an MRI at NewYork-Presbyterian Hospitalon 5/14 and was diagnosed with a slight strain of the leftbiceps...Recorded two out eld assists in 6/23 win at Arizona, bothcoming in the first inning (Johnson at home, Montero atthird)...marked his first career multi-assist game as anout elder...Recorded his 15th career multi-HR game in 6/29 loss vs.Seattle, homering twice o LHP Cli Lee...was his rstmulti-HR game since 9/8/09 vs. Tampa Bay...markedthe second time in his career he hit 2HR off left-handedpitching in the same game (also 5/11/06 w/ Oakland atToronto - both o Ted Lilly)...Was 4-for-4 with 1R, 2 doubles and 1BB, reaching base vetimes in 7/8 win at Seattle...tied his career high in hits (also9/8/06 w/ Oakland at Tampa Bay)...Scored at least one run in 10 consecutive starts from 7/10-26, tying a career high (also 9/5-15/07) and marking thelongest such streak in the AL in 2010...Hit ninth-inning "walk-off" RBI single and was 3-for-5 with 1R, 1HR and 3RBI in 7/16 win vs. Tampa Bay...washis third career "walk-o " hit, second with the Yankees...Collected his 16th career multi-HR game and second of 2010 (also 6/29 vs. Seattle) in 8/2 loss vs. Toronto, going2-for-5 with a two-run HR and solo HR...moved to CF at the start of the ninth inning, playing the position forthe first time since 9/1/08 w/ Chicago-AL at Cleveland...Fouled a ball o his left knee in 8/24 win at Toronto and was removed from the game with a 2-2 count inthe seventh...missed the next game on 8/25 at Toronto with soreness in the knee...also missed two games(9/3-4) with left knee stiffness...Hit ninth-inning, two-run "walk-o " HR and was 2-for-4 in 9/8 win vs. Baltimore...was his fourth career "walkoff" hit and third such HR...came one year to the day after his last "walk-off" homer (9/8/09 vs. Tampa Bay off Dan Wheeler)...became the fourth player in Baseball history ever to hit "walk-off " home runs exactly a yearapart and first since the Giants' Jack Clark on 9/4/81 and 9/4/82-credit: Elias...Started all nine Yankees postseason games, batting .176 (6-for-34) with 6R, 3 doubles and 2HR...the Yankeeswere 4-0 when he scored a run. Hit .249 (124-for-498) with 84R, 35 doubles, 29HR and82RBI in 150 games (126 starts in RF, 10 at 1B, four in LF,one at DH) in his first season with the Yankees¡K batted.250 (84-for-336, 20HR) as a left-handed batter and .247(40-for-162, 9HR) as a right-handed batter...Ranked third among Major League switch-hitters inhome runs, tied for third with 97BB and ranked sixth inRBI¡K ranked second overall in the AL in walks, markingthe most free passes by a Yankees switch-hitter sinceJorge Posada in 2000 (107)¡K ranked second in theAmerican League and seventh in the Majors with 4.26pitches seen per plate appearance¡K led the AL with a.585 slugging percentage on the road...Homered from both sides of the plate three timesin 2009 (4/29 at Detroit, 7/27 at Tampa Bay and 9/8vs. Tampa Bay)¡K according to SABR¡¦s David Vincent,his 10 career switch-hit homers are the most amongactive players and tied with Ken Caminiti, Tony Clarkand Mickey Mantle for the third-most all-time behindChili Davis and Eddie Murray (11 each)...According to the Elias Sports Bureau, his three sets ofswitch-hit homers in 2009 tied his high for any season (also 2007) and tied the ALsingle-season mark, also shared by Tony Clark (1998 with Detroit) and teammateMark Teixeira, who joined Swisher in accomplishing the feat in 2009...Homered from seven different spots in the batting order in 2009 (two througheight)¡K over the last 35 years, the only other player to homer from seven differentbatting order positions in one season for the Yankees was Dan Pasqua in 1987¡Xcredit: Elias¡K became the first player in franchise history to hit 21 of his first 24HRof the season on the road...He and teammate Mark Teixeira became the third set of Yankees teammates overthe last 50 years to each hit at least 25HR in their first full season in pinstripes (alsoAlex Rodriguez/Gary Sheffield in 2004 and Jason Giambi/Robin Ventura in 2002)...Made his Yankees debut in Opening Day loss at Baltimore on 4/6, going 1-for-1 witha pinch-hit double¡K was his fifth career Opening Day roster...Started his first game of the season on 4/9 at Baltimore in the Yankees first win of the season, going 3-for-5 with2R, 1 double, 1HR and a career-high-tying 5RBI¡K according to the Elias Sports Bureau, became the first player todrive in four-or-more runs in his first career start with the Yankees since Roger Maris on 4/19/60 at Boston, whenhe went 4-for-5 with 2HR and 4RBI¡K Elias also noted that Swisher became just the second Yankee in franchisehistory (since RBI became an official statistic in 1920) to record five-or-more RBI in a single game within his firstthree contests with the club (also Bob Tillman on 8/13/67 at Cleveland, third game w/ NYY, 2-for-5, 1HR, 6RBI)...Recorded a hit in each of his first nine games with an official at-bat, the longest hitting streak to begin a seasonof his career¡K batted .406 (13-for-32) with 5 doubles, 1 triple, 4HR and 11RBI over the stretch¡K according tothe Elias Sports Bureau, set a franchise record with nine extra-basehits (4 doubles, 1 triple, 4HR) in his first eight games with the Yankees,surpassing Roger Maris, who had seven in 1960¡K Elias also notes his11RBI tied the franchise record for most RBI in a player¡¦s first eight gameswith the club, matching Maris in 1960 and Robin Ventura in 2002...Reached base safely in each of his first 17 games, becoming the firstYankee to accomplish the feat since Matty Alou reached in his first 19games in 1973 (credit: Elias)...Hit solo-HR and was 1-for-3 with 2R and 1BB in 4/13 loss at TampaBay¡K also pitched a scoreless eighth inning (1.0IP, 1H, 1BB, 1K),becoming the Yankees¡¦ first position player to pitch in a game sinceWade Boggs on 8/19/97 at Anaheim¡K also became the first Yankee tohomer and record a strikeout while pitching in the same game sinceLindy McDaniel on 9/28/72 at Detroit¡K according to the Elias SportsBureau, since Divisional play began in 1969, only two other positionplayers have homered and pitched in the same game (Pittsburgh¡¦sKeith Osik on 5/20/00 and Texas¡¦ Jeff Kunkel on 5/20/89)...Led the team with 7HR and 19RBI in April, becoming the first offseasonacquisition to lead the Yankees in March/April RBI in his first year withthe club since Dave Winfield tied Bucky Dent for the team lead withnine April RBI in 1981¡Kalso became the first to hold the outright leadin both categories since Bobby Bonds in 1975 (4HR and 15RBI)...Was 0-for-3 in 5/6 loss vs. Tampa Bay before being ejected in the seventhinning following a called third strike¡K was his second career ejection(also 9/16/07 w/ Oakland vs. Texas)...Hit solo-HR¡Xthe first of back-to-back-to-back HR with Robinson Cano and Melky Cabrera¡Xand was 1-for-2with 2R and 2BB in 5/20 win vs. Baltimore¡K was his first homer at Yankee Stadium after hitting his first 8HR ofthe season on the road¡K according to Elias, became the first Yankee to hit each of his first 8HR of a season onthe road since Bernie Williams in 2003 (first 9HR on the road)¡K was the first player to hit his first 8HR as a Yankeeon the road since Chuck Knoblauch in 1998 (8HR)...Reached base safely in 30 consecutive games from 7/17-8/22, the longest such streak by a Yankee in 2009 andthe second-longest streak of his career (36 games in 2006 w/ Oakland)...Hit solo-HR in the second and ¡§walk-off¡¨ solo-HR in the ninth and was 2-for-3 with 1BB in 9/8 win vs. TampaBay¡K was his second career ¡§walk-off¡¨ hit and home run (also 8/5/08 w/ Chicago-AL vs. Detroit)¡K was his thirdmulti-HR game in 2009 and 14th of his career¡K became just the fourth Yankee to homer from both sides of theplate in the same game with one of those home runs being a ¡§walk-off¡¨ (also Mickey Mantle in 1956, Roy Whitein 1976 and Melky Cabrera on 4/22/09)¡K marked the eighth time it happened in Baseball history (also DonnieScott in 1985, Kevin Bass in 1987 and 1989 and Carlos Guillen in 2006)¡Xcredit: Elias Sports Bureau...Appeared in 14 of the Yankees¡¦ 15 postseason games in 2009, batting .128 (6-for-47) with 5R, 2 doubles, 1HR,2RBI and 7BB¡K hit his first career postseason homer in Game 3 of the World Series at Philadelphia. Hit .219 (109-for-497) with 21 doubles, 24HR and 69RBI in 153 games in his first andonly season with the White Sox (69 starts in CF, 47 at 1B, 16 in LF and 11 in RF)... washis fourth consecutive season with 20-or-more home runs...Led all AL switch-hitters in home runs and finishedsecond in RBI to Texas' Milton Bradley... his 102 homerssince 2005 are the fourth-most among Major Leagueswitch-hitters...Batted .227 (83-for-365) with 18HR as a left-handed batterand .197 (26-for-132) with 6HR from the right side...Hit in eight different spots in the lineup... battingaverage by position in lineup: No. 1 (.210, 22-for-105),No. 2 (.120, 3-for-25), No. 3 (.000, 0-for-1), No. 5 (.250,7-for-28), No. 6 (.228, 13-for-57), No. 7 (.235, 44-for-187),No. 8 (.211, 19-for-90), No. 9 (.250, 1-for-4)... hit .198(32-for-162) as a first baseman and .230 (76-for-331) asan outfielder...Led the American League with 4.51 pitches seenper plate appearance and tied for eighth with 82walks... owned the third-lowest batting averageamong AL qualifiers, ahead of only Oakland's DaricBarton (.214) and Jack Hannahan (.216)... hit .247 (64-for-259) with 19HR at U.S. Cellular Field, while batting.189 (45-for-238) with 5HR on the road... batted .385(5-for-13) with 2HR and 19RBI with the bases loaded...Made just two errors in 481 chances at 1B (.996 fieldingpercentage), while making 5E in 202TC as an outfielder(.975)...Made his fourth career Opening Day roster and startin 3/31 loss at Cleveland, going 2-for-4 with 2R...Walked in six consecutive plate appearances from 4/4-5at Detroit, becoming the first player to walk six straight times since Ivan Rodriguezin 2003 and the first White Sox player to do so since Chet Lemon in 1980...Hit his first career leadoff home run off Justin Verlander on 4/6 at Detroit...Batted .315 (29-for-92) with 7HR and 23RBI in June after hitting just .200 (37-for-185)in the previous two months... batted .195 (43-for-220) over the remainder of theseason...Recorded his 11th career multi-HR game and a career-high-tying 5RBI on 6/30 vs.Cleveland... homered from both sides of the plate for the seventh time in his careerand second time in 2008 (also 6/9 vs. Minnesota)... included was his fourth careergrand slam and second of the season (also 6/27 vs. Chicago-NL)...Hit his first career "walk-off" home run on 8/5 vs. Detroit, a 14th-inning, three-runshot off Joel Zumaya...Homered in a career-high four straight games from 8/18-21... included was his 100thcareer home run on 8/20 vs. Seattle...Snapped a career-high 0-for-19 stretch with an eighth-inning double on 9/2 at Cleveland... hit just .164 (9-for-55) over the remainder of the season, starting just 15 of the team's 25 games...Went 1-for-4 (.250) with 1R and 2BB in three ALDS games vs. Tampa Bay...Was traded to Chicago (AL) from Oakland on January 3, 2008 in exchange for RHP Fautino De Los Santos,LHP Giovany Gonzalez and OF Ryan Sweeney. Hit .262 with 22 home runs and 78 RBIin his third full season in the Majors...itwas the second consecutive season he improvedhis batting average as he hit .236in 2005 and .254 in 2006...added 100walks for a .381 on-base percentage,which also improved for the second consecutiveseason...now has a .361 careeron-base percentage, which is ninth bestin Oakland history...his batting average,on-base percentage and walks were allcareer highs as were his 36 doubles andthree stolen bases...matched his best with141 hits...ranked sixth in the AmericanLeague in walks, seventh in pitches perplate appearance (4.25) and 10th instrikeouts (131)...also tied for fourth insacrifice flies (9), tied for fifth in intentionalwalks (12) and was seventh in percent of pitches taken (62.8%)...ledthe A's in doubles, sacrifice flies and go-ahead RBI (20) and tied for theteam lead in games (150), runs scored (84) and hit by pitches (10)...thegames and runs scored were the fewest by an A's team leader since1987...reached the 20 home run plateau for the third consecutive seasonand his 22 home runs ranked second among AL switch-hitters to Cleveland'sVictor Martinez (25)...they matched the third best total in Athletics historyby a switch-hitter...now has 80 career home runs, which is a franchiserecord for a switch-hitter...continued to show versatility on defense as hestarted 57 games in center field, 46 in right field, 39 at first base and five atdesignated hitter...the starts in center field were the first of his career andthey led the team...is one of three players in Oakland history to start atleast 30 games at three different positions...joins Jay Payton in 2006 (51in left, 44 in center, 41 in right) and Jason Giambi in 1996 (43 in left, 42 atfirst, 38 at third)...in his career, he has made 164 starts in right, 134 at first, 82 in left, 57 in center and sevenat DH...the switch-hitter batted.291 (44 for 151) against lefthandedpitching and .250 (97 for388) against right-handers...had42 walks and 30 strikeouts againstlefties and 58 walks and 101strikeouts against righties...had a.458 on-base percentage againstleft-handers, which was third bestin the AL...now has a .271 (115for 425) career average againstsouth paws with 88 walks and 82strikeouts, compared to .244 (291for 1192) with 172 walks and 322strikeouts against righthanders...has hit 63 of his 80 career home runs off right-handers...had 14home runs and 52 RBI on the road compared to eight home runs and 26RBI in Oakland...15 of his 22 home runs were solo shots, 17 came at nightand 10 either tied the game or put the A's ahead...hit .234 in interleagueplay and now has a .196 (37 for 189) career average against the NationalLeague...hit in every spot in the order from second through sixth and ledthe A's in most starts batting third (78) and second (49)...hit 11 of his 22home runs from the two spot, which tied for second most in theAL...appeared in 59 games in center field, 57 in right field, 44 at first baseand six at designated hitter...was also 0 for 1 as a pinch hitter and is now 0for 6 in his career in the pinch...made his third consecutive Opening Daystart on April 2 at Seattle...it was his second consecutive start at first baseafter starting in right field in 2005...had his first of three two-homer gameson April 23 at Baltimore...the first home run was the 61st of his career,which broke Ruben Sierra's all-time Athletics record for home runs by aswitch hitter...also homered twice on July 26 at Seattle and September 9 atTexas and now has nine career multi-homer games...hit one home runright-handed and one home run left-handed in all three of his multi-homergames in 2007 and five times in his career...there have been just eightsuch performances in Athletics history...agreed to terms on a five-yearcontract through the 2011 season with a club option for 2012 on May11...had a career high five RBI on May 21 at Chicago and did so withoutthe aid of a home run...it was the eighth time in Oakland history a playerhas driven in at least five runs without a home run...that game started aseason best 10-game hitting streak (15 for 37, .405)...homered in all three games at Baltimore May 25-27, the second time he has homered in threestraight games in his career...had five home runs in eight games againstBaltimore and all five came in five games at Camden Yards...batted .333with five home runs and 23 RBI in May, all his best one-month figures in2007...now has a .301 (69 for 229) career average in May, his best for onemonth...was batting .305 at the end of May and then hit .216 in June and.205 in July...now has a .204 (74 for 363) average in June and July overthe last two years...his averaged had fallen to .248 on August 11 but he hit.294 over his final 41 games...committed his first error of the season as anoutfielder on August 25, snapping a 105-game errorless streak as an outfielderdating back to his last error on June 19, 2006 at Colorado in left field...scored a run in 10 consecutive games from September 5 to 15 (15runs total)...11 of those runs came against Texas and he scored 20 runs in18 games against the Rangers in 2007, the most ever by an Athletic againstTexas...was hit by a pitch in three consecutive games against Texas fromSeptember 14 to 16 and was ejected from the game after charging themound on September 16 after he was hit by a Vicente Padilla pitch in hisfirst at bat...he is the fourth player in Oakland history to get hit by a pitchin at least three straight games...also homered in each of those three gamesagainst the Rangers, the third time he has done that in his career...wassuspended for three games for charging the mound and served his suspensionfrom September 18 to 21...matched his season high with three hits inhis first game back on September 22 at Cleveland but went 3 for 23 (.130)over his final six games. Swisher got off to a brilliant start in his sophomore season by hitting .305 through the first two months of 2006, with 16 homers and 42 RBIs. His average dropped to .248 on Aug. 30, because he didn't hit over .240 for three months after May. But the 26-year-old hit 35 homers and drove in 95 runs. He set an Athletics record for home runs by a switch-hitter, breaking the mark of 23 set by Ruben Sierra in 2004. He ranked tied for eighth in the American League in homers and ranked sixth in walks with 97. He was also tied for fourth in strikeouts with 152, and eighth in runs scored with 106. He led the A's in games, runs, walks, extra-base hits, total bases, intentional walks and strikeouts. He started 80 games at first base and 71 games in left field. He stole his first base on May 30 against Kansas City, and struck out five times against San Diego on June 29. Swisher hit just .190 with six homers with runners in scoring position. Batted .236 in his rookie campaign with 21 home runs and 74 RBIs in 131 games...led American League rookies in RBIs and tied for the lead in home runs with Tampa Bay's Jonny Gomes...led Major League rookies in walks (55) and extra-base hits (52)...also ranked third among AL rookies in doubles (32), total bases (206) and strikeouts (110), fourth in runs (66) and slugging (.446), fifth in multihit games (26) and sixth in hits (109)...however, had the lowest batting average among all Major League batting title qualifiers, as his .2359 mark was .0001 points lower than Florida's Mike Lowell who hit .2360...his 32 doubles were fourth most in Oakland history by a rookie, his 21 home runs tied for fifth most and his 74 RBIs were sixth most...ranked fourth among AL switch-hitters in RBIs and tied for fourth in home runs...his home runs were third most by an Athletics switch-hitter behind Ruben Sierra, who hit 23 in 1994 and 22 in 1993...ranked second on the A's in home runs and walks and was third in RBIs and doubles...averaged 4.13 pitches per plate appearance, which ranked eighth in the AL...was batting .218 (17-for-78) with three home runs and eight RBIs over his first 22 games before going on the disabled list on May 2 with a right acromio-clavicular (AC) joint sprain...was injured running into wall on a Jeremy Reed fly ball May 1 against Seattle...was reinstated from the DL on May 25 and hit .267 (69-for-258) with 13 home runs and 50 RBIs over a 70-game stretch through Aug. 13...was on the bereavement list from Aug. 14-18...hit .183 (23-for-126) with five home runs and 16 RBIs over his final 39 games following his return...his batting average broke down to .203 (25-for-123) against left-handed pitching and .248 (84-for-339) against right-handers...his average against lefties was fifth lowest in the AL...hit 21 of his 24 home runs off righties...batted .219 (30-for-137) with runners in scoring position, including .200 (15-for-75) with RISP and two outs and .167 (2-for-12) with the bases loaded...batted .263 (72-for-274) with 16 of his 21 home runs the first time he saw a pitcher in a game, .221 (25-for-113) the second time and .160 (12-for-75) after that...hit .218 (64-for-294) over the first six innings of a game and .268 (45-for-168) from the seventh inning on...batted .172 (45-for-262) with two strikes but had 10 of his 21 home runs and 36 of his 74 RBIs with two strikes...started a total of 128 games for the A's, including a team-leading 115 in right field and 13 at first base...batted .246 (102-for-414) with all 21 of his home runs coming while playing right field and .156 (7-for-45) as a first baseman...was also 0-for-3 as a pinch-hitter...hit in the second, sixth, seventh, eighth and ninth spots in the order and made a team-leading 74 starts batting eighth...had his first of two two-homer games in the second game of the season on April 6 at Baltimore...had a career high-tying three hits in that game, one of his four three-hit games in 2005...had a strikeout in 10 consecutive games from April 7-18 (15 total)...batted .391 (9-for-23) with three doubles and a RBI during a six-game rehab stint with Triple-A Sacramento from May 19-24...had a season-best eight-game hitting streak from May 3 to June 7 (12-for-30, .400)...snapped a 34-game, 121-at-bat homerless streak on June 16 against the New York Mets to begin a 31-game stretch through July 23 during which he had 11 home runs and 31 RBIs...the A's won 9 of the 10 games in which he homered over that stretch and were 16-3 when he homered for the season...are now 17-4 when he homers in his career...had his second two-homer game on June 26 against San Francisco and matched his career high with four RBIs in that game...hit one home run left-handed and one right-handed to become the second player in Oakland history (Ruben Sierra, June 7, 1994 vs. Milwaukee) and the third in Athletics history (Wally Schang, September 8, 1916 vs. New York) to homer from both sides of the plate in the same game...had three home runs and seven RBIs in three games against the Giants...had his first of two game-winning hits in extra innings on July 10 at Chicago when his RBI double in the top of the 11th inning lifted the A's to a 9-8 victory...broke a 5-5 tie with a two-run home run in the 12th inning of the A's 10-5 win at Baltimore on Aug. 29...had 12 doubles in 26 games in July, which tied for the second best one-month double total in Oakland history (14, Jason Giambi, July 1996)...capped off the biggest ninth-inning comeback in Oakland history on Sept. 7 against Seattle when he walked with the bases loaded to force in the fifth run of the A's five-run ninth inning in an 8-7 A's win...started the inning with a single. The A's first round draft pick from 2002 made his Major League debut in just his third professional season...was called up by Oakland on September 3 and hit .250 with two home runs and eight RBI in 20 games...started 13 of the A's first 14 games after he was brought up because of the injury to Jermaine Dye (10 in left field, three in right field) and made 18 starts overall (11 in left field, three in right field, two at first base, two at designated hitter)...was 5 for 10 (.500) against left handed pitching and 10 for 50 (.200) against right-handers...hit .471 (8 for 17) during the day and .163 (7 for 43) at night...made his ML debut on September 3 at Toronto with a start in left field...walked in his first plate appearance and then doubled off Ted Lilly in the fourth inning for his first ML hit...hit his first ML home run on September 5 at Toronto off Sean Douglass, a two-run shot in the sixth inning that was also his first ML RBI...had a career high three hits on September 14 against Texas...made his first start at first base on September 25 at Anaheim...started the year at Sacramento and made his Triple-A debut...batted .269 with 29 home runs and 92 RBI in 125 games with the River Cats...added 103 walks, which led all of minor league baseball, and tied for fourth in runs (109)...led the Pacific Coast League in walks and runs scored and was eighth in on-base percentage (.406)...led Sacramento in walks and runs scored and tied with Dan Johnson for the lead in home runs...also tied with Johnson for the most home runs in the A's farm system...posted minor league bests in batting, runs, home runs, RBI, walks, on-base percentage (.406) and slugging percentage (.537)...also struck out 109 times...hit .294 (35 for 119) against left handed pitching and .259 (84 for 324) against right-handers...hit in every spot in the order except fourth and ninth and saw most of his action hitting third (51 for 185, .276) and fifth (31 for 115, .270)...was 2 for 18 (.111) with the bases loaded but one of the hits was a grand slam...appeared in 108 games in center field, 11 games in right field, two in left field and one at first base...reached base safely via hit or walk in 26 consecutive games from June 11 to July 7...went 22 for 77 (.286) over that span with 41 walks...put together his best batting average in the month of July when he hit .290...added 22 RBI in 25 games, his most RBI in a month...had a two-home run, six-RBI performance on July 24 at Las Vegas...also hit two home runs on August 23 at Fresno...hit nine home runs in August, his most in a month in 2004...hit 20 home runs over his final 69 games after hitting just nine home runs over his first 56 games. Split the season between Single-A Modesto and Double-A Midland and hit a combined .256 with 15 home runs and 86 RBI in 127 games...ranked fifth in the A's farm system in RBI...added 78 walks and eight hit by pitches for a .363 on-basepercentage...also had 38 doubles and four triples for a .447 slugging percentage...his 11 sacrifice flies tied for fifth in all ofminor league baseball...struck out 125 times...hit .400 (8 for 20) with 18 RBI with the bases loaded...appeared in 98 gamesin centerfield, 12 in right field, five at first base and two in left field...was also 19 for 59 (.322) with five home runs in 15 gamesas the designated hitter...batted in every spot in the order from second through seventh but saw most of his action hitting third(74 for 262, .282)...began the year at Modesto where he batted .296 with 10 home runs and 43 RBI in 51 games...finishedthird on the team in home runs despite spending just two months with the club...homered twice on May 2 against InlandEmpire, capping a six-game stretch where he had four home runs and 12 RBI...was California League Player of the Week forthe week of April 28 to May 4...reached base safely via hit or walk in 31 consecutive games from April 17 to May 24 and 47of 51 games overall...was promoted to Midland on June 8 and batted .230 with five home runs and 43 RBI in 76 games withthe Rockhounds...had a season high five RBI on August 17 at Arkansas. Began his professional career at Single-AVancouver of the Northwest League but was promoted to Single-A Visalia of the California League after 13 games...batted acombined .242 at both stops with six home runs and 35 RBI in 62 games...added 39 walks for a .360 on-base percentage...appeared in 53 games in center field and batted .281 (9 for 32) in nine games at designated hitter...batted .250 with twohome runs and 12 RBI in 13 games at Vancouver...hit his first professional home run on June 22 at Spokane...was promotedto Visalia on July 1 and hit .240 with four home runs and 23 RBI in 49 games...average improved to .478 with runners in scoringposition and two outs...went 2 for 6 (.333) in two playoff games for Visalia. July 3, 2016 Scranton/Wilkes-Barre RailRiders released 1B Nick Swisher. June 28, 2016 Scranton/Wilkes-Barre RailRiders placed 1B Nick Swisher on the temporarily inactive list. April 14, 2016 New York Yankees signed free agent OF Nick Swisher to a minor league contract. 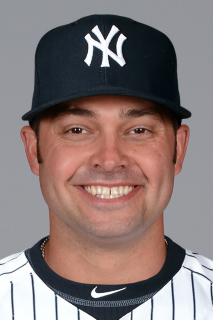 April 14, 2016 1B Nick Swisher assigned to Scranton/Wilkes-Barre RailRiders. March 28, 2016 Atlanta Braves released LF Nick Swisher. August 8, 2015 Atlanta Braves activated LF Nick Swisher. August 4, 2015 Cleveland Indians sent OF Nick Swisher on a rehab assignment to Columbus Clippers. July 30, 2015 Cleveland Indians sent OF Nick Swisher on a rehab assignment to Lake County Captains. July 23, 2015 Cleveland Indians sent OF Nick Swisher on a rehab assignment to Akron RubberDucks. July 20, 2015 Cleveland Indians sent DH Nick Swisher on a rehab assignment to Lake County Captains. May 5, 2015 Cleveland Indians activated 1B Nick Swisher from the 15-day disabled list. April 24, 2015 Cleveland Indians sent 1B Nick Swisher on a rehab assignment to Columbus Clippers. September 29, 2014 Cleveland Indians activated 1B Nick Swisher from the 15-day disabled list. June 12, 2014 Cleveland Indians activated 1B Nick Swisher from the 15-day disabled list. June 10, 2014 Cleveland Indians sent 1B Nick Swisher on a rehab assignment to Akron RubberDucks. May 24, 2013 Cleveland Indians activated 1B Nick Swisher from the paternity list. May 21, 2013 Cleveland Indians placed 1B Nick Swisher on the paternity list. January 3, 2013 Cleveland Indians signed free agent 1B Nick Swisher. November 3, 2012 RF Nick Swisher elected free agency.